Most people agree that Bali is definitely one of the most beautiful places in the world. Its popularity even surpasses the country it belongs, Indonesia. The wonderful story about Bali seems like endless, and in this article I am going to bring your imaginations to one of Bali’s most wonderful tourism site, Uluwatu. Uluwatu is an exotic and unique in the same time temple complex in southern part of Bali. The name of Uluwatu literally means The Ancestor’s Temple. The legend said that once a holy man did moksa (disappear from the world without dead). Then the temple is built as a monument of respect for that hallow. The temple itself is just one of attraction for the tourists; there are many wonderful objects you can find in Uluwatu. In my opinion, there are at least three reasons why people should visit Uluwatu when they’re in Bali. First is its wonderful location in the south area of Bali. Second thing is monkeys “guarding” the temple. Third is temple itself, the ancient temple has mystic aura when you are in there. As I said earlier, Uluwatu is located in beautiful if not wonderful location in Bali. It is in calcareous area in south end of Bali Island. Specifically, Uluwatu Temple located in the edge of the barrier reef. To make it more exotic, you can see clearly the Indian Ocean and its waves hitting the corral crag below from the temple. In order to visit Uluwatu, tourists will have to pass small winding road by vehicles before arrive in Uluwatu Temple parking lot. From the parking lot, tourist will have to buy ticket and will be given sarong and silky belt to wear to respect the temple sanctity. A horde of the monkeys will welcome the visitor in the entrance gate of Uluwatu. 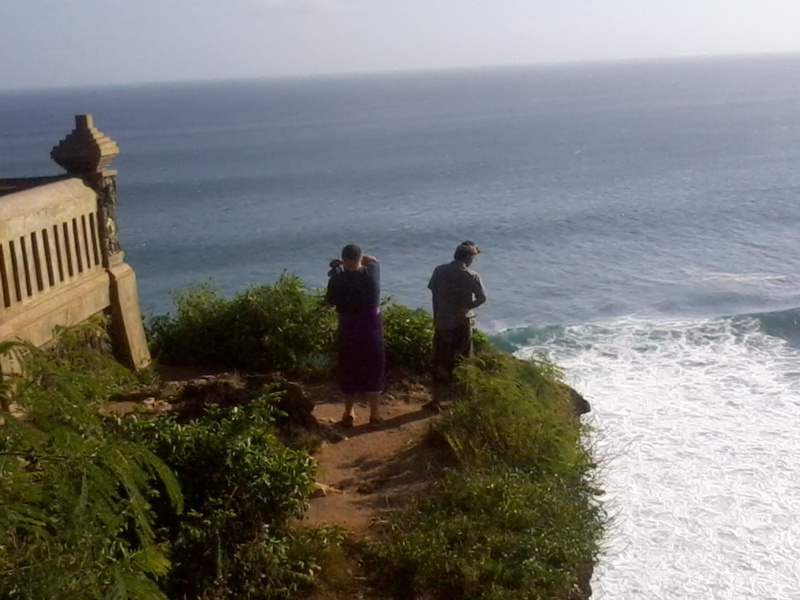 The tour in Uluwatu is a walking in broad complex. The temple itself is just a small part of the broad complex with high density forest and a home for hordes of monkeys. Local Balinese people believe that the monkeys are holy monkeys, the incarnation of holy men which guard the temple from any negative things. For safety reason, the tourists are suggested to not wear hats and any accessories that can attract the monkeys to steal it. It maybe sounds a bit ridiculous but you have to believe and obey it if you’re in Uluwatu. The monkeys are wild and furious and they love to steal any interesting accessories you wear, steal your camera and even stripped your clothes. The tourists will walking on the narrow path surrounded by trees and bushes and of course monkeys. Some of the pathways are adjacent to cliff which the tourists can see Indian Ocean clearly and sea waves hitting corals below you. For some people it is scary, but for others it is very interesting thing to see. They even break the divider wall just to take a wonderful photo. A magical holy place in an exotic location with also unique guards is simply an interesting place to visit when you’re in Bali. For me, Uluwatu is a must destination to visit when you’re in Bali. So, next time you’re in Bali don’t forget to ask your guide to arrange some tour in Uluwatu and take beautiful photos as a souvenir.